Pissarro captured the rural essence and isolation of Montfoucault in this painting completed during his last visit in 1876. This expansive depiction of the haystacks at Montfoucault is somewhat reminiscent of previous landscapes at Pontoise in that it includes a broad view of the fields among the surrounding hills. The striking difference is that the Pontoise paintings included the houses of L’Hermitage. This painting is totally agricultural, showing only fields against a heavily wooded area, which emphasizes its total isolation. 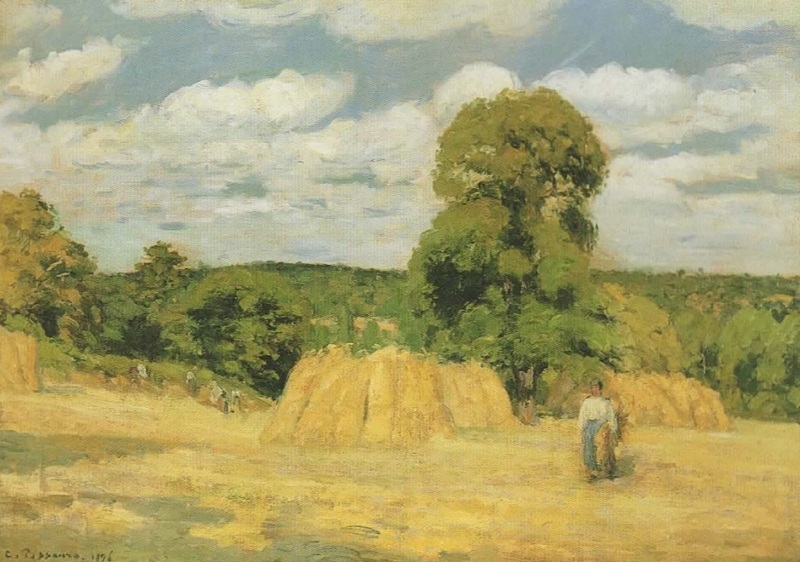 Our eyes are immediately drawn to the large haystacks in the center front, anchored at the right by a large tree, whose tall branches lead the eye upward into the billowy clouds and bright azure sky. Another haystack to the right forms what is practically an isosceles triangle, making the composition symmetrical and providing a sense of stability. The strength of the sunlight, evident in the golden grain scattered across the field, is intensified by the long lavender shadows in the lower left, which suggest the coming sunset. The palette takes a slice from the color wheel, advancing from yellow-gold in the foreground to the lush green of the tree and the forest in the background to the deep azure blue of the sky. The progression is interrupted only by the painterly clouds whose puffiness sets up a rhythm in the sky contrasting the solidity of the triangle below. The woman in the foreground bears little resemblance to the virtuous gleaners depicted by Millet. She looks out at the viewer with no expression to suggest her mood or any religious or moral allusion. She does, however, provide a human scale for measuring the height of the haystacks, and the blue in her skirt reflects the color of the sky. At the far left, a straggling group of workers appears to be leaving the field, leaving the lonely woman as a metaphor for the isolation and loneliness of the place.